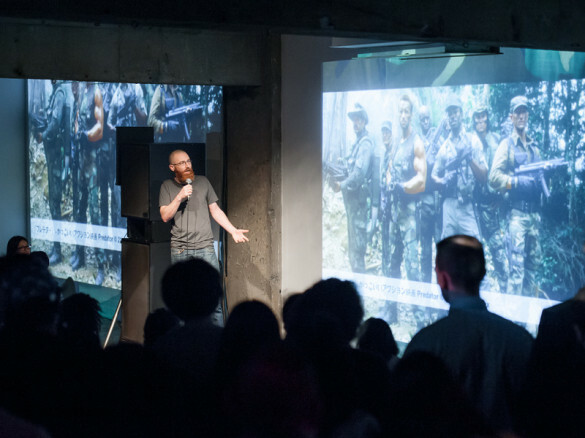 I recently gave a talk at Tokyo PechaKucha Night Vol 124. Basically an updated & much snappier version of the camo talk I did for Hackers & Designers last year. He deconstructs the ironies associated with fashion being at odds with the military, pointing out that the armed forces are now more concerned with the image that camouflage conveys to new recruits than with its original tactical use. That happens, and I point to some of my favourite projects artists, designers & state militaries have done with camouflage recently. Also, Japan. Friends who wish to take no credit have supplied me with a nicely edited video from the event, so here for your viewing pleasure is me saying things about camouflage for 20 slides at a speed of 20 seconds per slide. Thanks anonymous friends. Thanks also to Michael Holmes who does a great job of documenting the Tokyo events & you should totally hire next time you need a photographer out there. If you’re interested in a much longer & more detailed academic treatise on the symbolic function of camouflage in modern military uniforms, hijack the account of the person nearest to you with journal access & track down: The digital revolution: Camouflage in the twenty-first century by Anthony King, University of Exeter, UK. It’s in Millennium: Journal of International Studies 2014, Vol. 42(2). Thanks for watching. Like, subscribe, and have a nice day.